The Age of Categories is dead. Strangely, it never went by that name, or any name. Also curious is the fact that its boundaries are unclear: it overlapped the Age of Enlightenment, the Age of Reason and some others, but succumbed to the atomizing atmosphere of the Information Age. Knowledge, it held, went hand in hand with nomenclature and delineation. As science developed, branches formed. Elemental to the college and university were academic departments, each of which came surrounded by high walls. A datum was deemed to fit within the confines of chemistry or sociology or the history of spoons or whatever, and that was more or less that. Now we perceive the limitations of those old categories and scoff; we value multidisciplinarianism and genre-bending. The life of the mind is more chaotic, but also more exhilarating. Often a new boundary-crossing perspective comes simply from going back to original sources — to the time before categories hardened. Study the famous late correspondence between Thomas Jefferson and John Adams, Steven Johnson notes, and you find only five references to Benjamin Franklin and three to George Washington, but 52 to Joseph Priestley, the scientist/theologian who is often credited with the discovery of oxygen. Johnson is an exemplar of the post-categorical age. In “Everything Bad Is Good for You,” he brought brain chemistry and other disciplines to bear on pop culture, and argued, among other things, that video games make you smarter, not dumber. “The Ghost Map,” his 2006 book about the great cholera epidemic in 19th-century London, mixed bacteriology, epidemiology and history. Johnson’s new book, “The Invention of Air,” shows its genre-mixing in its subtitle; it uses Priestley as the fulcrum for a story that blends “science, faith, revolution and the birth of America.” What enlivens the book is that Johnson does not simply describe the system within which Priestley and his contemporaries hashed out the features of classical science; he sets it against other, later systems for comprehending physical reality, showing laymen how far we have come from the classical age of science. Johnson is better at popularizing science than at writing historical narrative. He opens his account at the London Coffee House in 1765, with Priestley meeting some of his fellow scientific dabblers; the scene-setting is meant to draw you in, but it feels both flat and overwrought. I say this not to be petty but to encourage the reader to push on. When Johnson discusses Priestley going on a “streak of legendary proportions” — a period when he made a series of major discoveries and inventions that would shape the course of science — he himself comes alive as a thinker, delving into the concept of “streaks of innovation” and where they come from, pulling and stretching “streak” so that the Renaissance shares a page with Joe DiMaggio’s 56-game hitting streak. Much of “The Invention of Air” is standard history-of-science; the topics have been covered before, and well: Jenny Uglow’s 2002 book “The Lunar Men” was a fuller, richer account of the interpersonal linkages of Priestley, James Watt, Erasmus Darwin and other Enlightenment tinkerers. But Johnson adds something valuable. “How much of the Enlightenment do we owe to coffee?” he asks at one point, then goes off into a little essay on coffeehouse culture and coffee’s effects on the brain. Elsewhere he offers a brilliant “Intermezzo” set in 300 million B.C., which roots Priestley’s work on oxygen, and the whole advent of life on earth as we know it, in the Carboniferous era, when supersize plant-life — 130-foot-high mosses, trees with three-foot leaves — led to a rise in the oxygen content of the atmosphere. The era didn’t last long (in the grand scheme of things), but in addition to changing the air, all that decayed vegetal mass eventually transformed into stored energy in the earth, which humans would begin to use in Priestley’s time to fuel the industrial age. Thus Johnson completes a rather enormous circle, as Priestley did much of his work literally on top of England’s coal fields. “The Invention of Air” isn’t only about air, or science, however. There is the rest of the subtitle: “faith, revolution, and the birth of America.” As a theologian, Priestley was a bit of a wild man for his time; his scientific perspective led him toward a variety of materialism, and he wrote tracts against the worship of saints and the divinity of Jesus. This endeared him to Thomas Jefferson, who credited Priestley with developing a Deistic faith — shorn of supernatural paraphernalia — that he could believe in. One reason Johnson seems to have been drawn to Priestley is because of his style; Priestley was irrepressibly open, sharing his data and observations with whoever was willing to listen. This may have cost him some credit in discoveries, but to Johnson it makes Priestley the godfather of the open-source era. And this may be where Johnson’s genres blend together most fully. 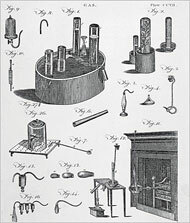 As a “compulsive sharer,” Joseph Priestley believed wholeheartedly in the free flow of information: in letting insights from science flow into the streams of faith and politics, in trusting in the human mind as the ultimate homeostatic system, able eventually to find its internal balance no matter how large the disruption. In his day, the French and American Revolutions were the major tests to that theory. We in our age have our own.